Second only to the last few months of winter, the most difficult waiting period for a wine grower is the time just prior to verasion (when the grapes soften and change color). In the preceding weeks you have been waging a seemingly endless war against fungus and insects, keeping the canopy healthy and open, as well as making sure the grapes are exposed to a good deal of sunlight. You have watched the grapes reach full size, and it just seems as if nothing else is ever going to happen. Every day you inspect the bunches and check for the slightest change in color and still nothing. Is something wrong, you begin to wonder, they were changing by this time last year. What's going on here! Then finally one day, you notice something on a few of of the berries. Is it black rot? Anthracnose? Some downy Mildew that you've missed? No, wait a minute these grapes are turning! It's here it's finally here, verasion. 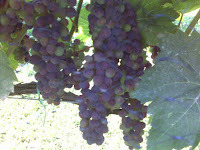 What seemed like it was never going to happen has begun, the grapes are ripening. It's a wonderful sign of good things ahead. Now I just have to get the nets up to keep the birds away. You gotta love it! I appreciate you causing this to be article available, other site is also congratulations.